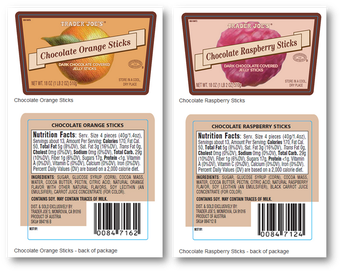 Ottawa, March 29, 2016 - Transilvania Trading is recalling Trader Joe's brand Chocolate Orange Sticks and Chocolate Raspberry Sticks from the marketplace because they may contain milk which is not declared on the label. People with an allergy to milk should not consume the recalled products described below. The following products have been sold at Pirate Joe's, located at 2348 West 4th Avenue, Vancouver, British Columbia.